Enter your zip code to begin. 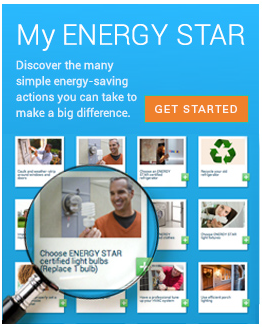 The links below will take you to Web sites external to the energystar.gov domain. Visit website to learn more Appalachian Power offers a mail-in rebate on the purchase and installation of Air Purifiers (Cleaners). Offer valid 05/01/2014 through 12/31/2019. Other restrictions may apply; please visit the website for additional details. Visit website to learn more Bay City Electric Light & Power offers a bill credit on the purchase and installation of air purifier . Offer valid 01/01/2018 through no current end date. Other restrictions may apply; please visit the website for additional details. Visit website to learn more Black Hills Energy offers a mail-in rebate on the purchase and installation of air purifiers cleaners. Offer valid 01/01/2016 through 12/31/2019. Other restrictions may apply; please visit the website for additional details. Visit website to learn more Cape Light Compact offers a mail-in rebate on the purchase and installation of Air Purifiers (Cleaners). Offer valid 01/01/2019 through 12/31/2019. Other restrictions may apply; please visit the website for additional details. Visit website to learn more Efficiency Maine offers a mail-in rebate on the purchase and installation of Air Purifiers (Cleaners). Offer valid 03/01/2017 through 06/30/2019. Other restrictions may apply; please visit the website for additional details. Visit website to learn more Entergy Arkansas offers a mail-in rebate on the purchase and installation of air purifiers cleaners. Offer valid 01/01/2019 through 12/31/2019. Other restrictions may apply; please visit the website for additional details. Visit website to learn more Eversource (MA) / NSTAR offers a mail-in rebate on the purchase and installation of Air Purifiers (Cleaners). Offer valid 01/01/2019 through 12/31/2019. Other restrictions may apply; please visit the website for additional details. Visit website to learn more Eversource (NH) offers a mail-in rebate on the purchase and installation of Air Purifiers (Cleaners). Offer valid 01/01/2019 through 12/31/2019. Other restrictions may apply; please visit the website for additional details. Visit website to learn more Indianapolis Power & Light offers a instant rebate on the purchase and installation of air purifiers cleaners. Offer valid 01/01/2018 through 12/31/2020. Other restrictions may apply; please visit the website for additional details. Visit website to learn more Liberty Utilities offers a mail-in rebate on the purchase and installation of Air Purifiers (Cleaners). Offer valid 01/01/2019 through 12/31/2019. Other restrictions may apply; please visit the website for additional details. Visit website to learn more National Grid offers a mail-in rebate on the purchase and installation of Air Purifiers (Cleaners). Offer valid 01/01/2019 through 12/31/2019. Other restrictions may apply; please visit the website for additional details. Visit website to learn more Nebraska Energy Office offers a low-interest loan on the purchase and installation of Air Purifiers (Cleaners). Offer valid 01/01/2010 through no current end date. Other restrictions may apply; please visit the website for additional details. Rebates offered by New Hampshire Electric Cooperative, Inc.
Visit website to learn more New Hampshire Electric Cooperative, Inc. offers a mail-in rebate on the purchase and installation of Air Purifiers (Cleaners). Offer valid 01/01/2019 through 12/31/2019. Other restrictions may apply; please visit the website for additional details. Visit website to learn more PSEG Long Island offers a mail-in rebate on the purchase and installation of Air Purifiers (Cleaners). Offer valid 01/01/2019 through 12/31/2019. Other restrictions may apply; please visit the website for additional details. Visit website to learn more Public Service Company of New Mexico (PNM) offers a mail-in rebate on the purchase and installation of Air Purifiers (Cleaners). Offer valid 01/01/2008 through no current end date. Other restrictions may apply; please visit the website for additional details. Visit website to learn more Public Service Company of Oklahoma (PSO) offers a buy-down/discount on the purchase and installation of air purifiers cleaners. Offer valid 02/01/2019 through 11/30/2021. Other restrictions may apply; please visit the website for additional details. Visit website to learn more Unitil offers a mail-in rebate on the purchase and installation of Air Purifiers (Cleaners). Offer valid 01/01/2019 through 12/31/2019. Other restrictions may apply; please visit the website for additional details.